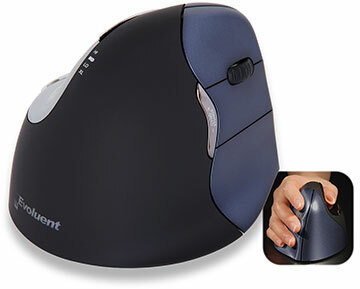 Manager and any other existing mouse software, except touchpad driver, to avoid software conflict. A. In the Buttons tab, uncheck the box for Switch Primary and Secondary Buttons. B. In the Pointer Options tab, uncheck the box for Enhance Pointer Precision and set the pointer speed slider to the middle position. This is very important. Connect the cable to a USB port directly on the computer. The Evoluent may not work with some external USB hubs, docking stations, and KVM switches. Connect the receiver to a USB port directly on the computer. Slide the On/Off switch to the green position. The Evoluent may not work with some external USB hubs, docking stations, and KVM switches. 4. 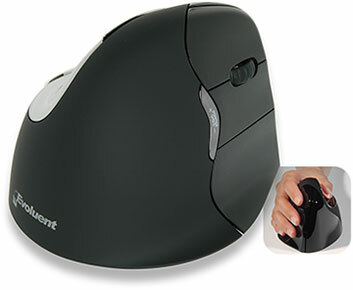 Press + or – on the Pointer Speed button on the side of the mouse to light up three indicator lights on the thumb rest for optimal pointer speed. 5. Evoluent Mouse Manager for Windows (driver) may optionally be installed to program the buttons.Download the driver here. 6. If a message appears about the driver not passing Windows Testing, click Continue Anyway. This message may appear multiple times. Click Continue Anyway each time. 7. After install is finished, button functions may be changed by double clicking the E icon on the task bar to open Evoluent Mouse Manager. Win 7: Go to Control Panel, Programs and Features, click Evoluent Mouse Manager, and click Uninstall. Win 10: Start menu, Settings, System, Apps & Features, click on Evoluent Mouse Manager, and click Uninstall. external USB hubs, docking stations, and KVM switches. Go to System Preferences, Bluetooth and click Setup New Device or the plus sign + to add the mouse. Slide the On/Off switch on the Evoluent to the green position or cycle it off and on to begin pairing. 3. Press + or – on the Pointer Speed button on the side of the mouse to light up three indicator lights for optimal pointer speed. 4. The Evoluent logo (wireless with receiver) or a red light on the thumb rest (Bluetooth/Mac) blinks when the battery is low. 5. 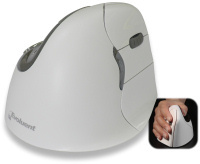 Evoluent Mouse Manager for Mac (driver) may optionally be installed to program the buttons. Download the driver here. You may have to temporarily allow installing programs downloaded from anywhere in System Preferences, Security and Privacy. 6. After install is finished, button functions may be changed by clicking the E icon in System Preferences to open Evoluent Mouse Manager. The Evoluent Mac driver (known as “extension”) may be blocked in Mac OS 10.13 High Sierra by a new system security feature known as Secure Kernel Extension Loading. Refer to this article on the Apple web site: https://developer.apple.com/library/archive/technotes/tn2459/_index.html. If the mouse buttons do not perform your selected functions in the driver, or if the system shows “no VerticalMouse device attached”, go to System Preferences, Security to see if there is an option to allow the Evoluent extension. The option is only there for 20 minutes after installing the driver or restarting. If it is not there, restart the computer to reload it. The extension will be listed as software from Jack Lo (the creator). If after allowing the extension it is still not working, restart the computer again. If restarting does not work, uninstall and reinstall the Evoluent software and restart the computer. If the Evoluent extension is allowed, the command will return a line of info. If it is blocked, the line will be blank. When it is blank, reinstall the driver and restart the computer. 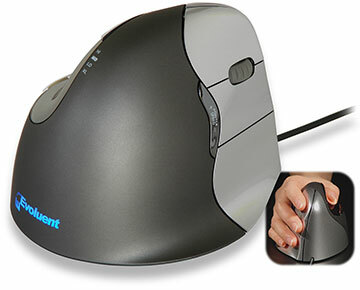 Connect the VerticalMouse to a USB port directly on the computer. 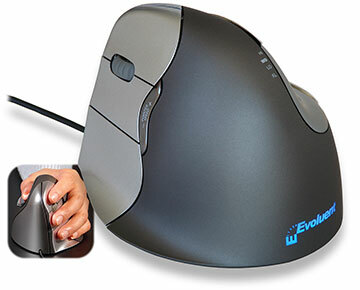 There is no Evoluent driver, but the VerticalMouse still has basic functionality. VM3 wireless is compatible with Unix, but VM3 wired is not. VM4 has not been tested with UNIX. No driver is supplied. At least left and right click are supported by most Linux versions. Some versions may support more buttons. For instructions on how to customize the buttons, see https://www.howtoforge.com/tutorial/map-mouse-on-linux/. No driver is supplied. 5 buttons and the scroll wheel are functional with system support. hand on the mouse surface. Tilt it slightly to the side to disable tracking. Slide it without moving the pointer. 1. Put in a fresh battery with the positive terminal facing out. 2. 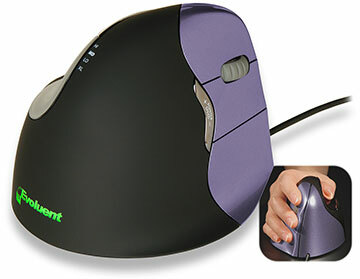 Push the power switch on the bottom of the mouse to the green position. 3. Pull out the receiver and push it back in a USB port to see if Windows makes the disconnect and reconnect sounds. Ensure that speakers are connected and the volume is turned on. The Evoluent Mac driver (known as “extension” in Mac language) may be blocked in Mac OS 10.13 High Sierra by a new system security feature. Refer to this article on the Apple web site: https://developer.apple.com/library/content/technotes/tn2459/_index.html. If the mouse buttons do not perform your selected functions in the driver, go to System Preference, Security to see if there is an option to allow the Evoluent extension.The option in the security system preference is only there for 30 minutes after the extension tries to load. If it is not there, restart the computer to reload it. The extension will be listed as software from Jack Lo (the creator). If after allowing the extension it is still not working, restart the computer again. To determine if Secure Kernel Extension Loading is blocking the Evoluent extension, go to Utilities and open the Console, select the system.log on the left, and search for ‘Evoluent’ to look for a line like this: EvoluentAgent: IORegistryEntrySetCFProperties Error! Result = 0x10000003. If the system is blocking the extension, there will be a new line each time you try to change the settings. VM4 has only one battery for light weight. To save power, early Bluetooth/Mac production units are designed to enter sleep mode and disconnect from the computer in 8 minutes. The Mac OS displays “Connection Lost” when the mouse goes to sleep. Moving the mouse reestablishes connection automatically in a few seconds and the Mac OS displays “Connected”. Later production units do not disconnect as long as the system is on. Reset the mouse by turning the On/Off switch off and on to restore proper tracking. 1. Turn on the mouse and confirm that a green indicator is visible inside the power button. 2. Insert the receiver into a USB port, preferably directly on the computer. 3. Download the receiver pairing utility here (for Windows only). Click Run. When it finishes downloading, click Run again to start the utility and follow its instructions. If the mouse does not work after that, the receiver or the mouse may be defective. 1. Press and hold top thumb button. 2. Turn on power switch. Pointer speed lights flash on, off, and on again. 3. Quickly insert receiver into computer. Pointer speed lights flash twice when paired. 1. Go to Control Panel, Mouse, and set the pointer speed slider to the middle. 2. Check the box for Enhance Pointer Precision. 3. On VerticalMouse 4, press the Pointer Speed button on the side to light up three indicators lights to the MD setting. 4. On VerticalMouse 3 rev 2, press the button on the bottom of the mouse until the light is blue. CAD programs typically use a middle click for panning. 1. When the Evoluent driver is not installed, the wheel button is the middle button. Press the wheel to perform a middle click. 2. When the Evoluent driver is installed, select the “Wheel/Middle Click” function for any button to make it work as a middle click. Do not select Auto Pan or Zoom. 3. In AutoCAD, the wheel/middle button is configurable at the command prompt.Type mbuttonpan and set to 1 to enable panning. If set to 0, a pop up menu appears when pressing the wheel button. Any button can be disabled by installing the driver and selecting the None function at the top of the pull down menu. Right click the mouse icon on the taskbar, click Close to shut down the driver. Go to Control Panel, Mouse, uncheck the box for Switch primary and secondary buttons. Go to Start, All Programs, VerticalMouse Manager, and click VerticalMouse Manager to restart the driver.The current driver automatically sets the top button to left click during installation. When the driver is not installed, go to Control Panel, Mouse, Pointer Options, and check the box for Enhance Pointer Precision (Windows XP). The current driver includes built-in control of pointer precision/acceleration. Both mouses must be in USB ports. 1. 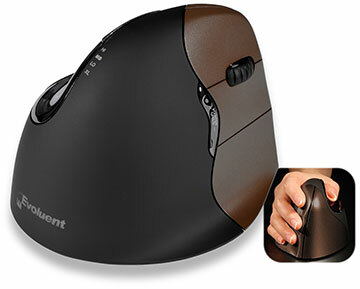 Connect the first VerticalMouse to a USB port. 2. Install the driver update. 3. Connect the second VerticalMouse to another USB port. 4. Install the driver update again. When the installation wizard asks if you wish to install again, click Yes. Hotkeys are fully supported by XP. Some hotkeys may not work in other operating systems. Back – go backward in a web or file browser. Fwd – go forward in a web or file browser. Web – open the default web browser. E-Mail – open the default email program. My Comp – open my computer to see all the drives. Media Player – open the default media player. Play/Pause – play or pause the media player. Previous Track – go back one track in the media player if there is a previous track. Next Track – go back one track in the media player if there is a next track. Volume Down – reduce the sound volume. Volume Up – increase the sound volume. Mute – mute the sound output. Wake – wake the computer from standby. The BIOS must be configured for S1 suspend for this to work. Sleep – put the computer on standby. Power – shut down the computer. Key functions on Evoluent keyboards may be reassigned or remapped with this Microsoft Utility. The system BIOS must be configured for S1 suspend mode for the Wake key to work during standby. The system fans are typically on during S1 standby. The wake key does not work when the BIOS is configured for S3 standby because the keyboard is not powered. This is normal. The system fans are typically off during S3 standby. Hold down F12 to eject the CD tray. Press and quickly release F12 as normal F12.